5 Hard-Won Sibling Lessons from Supergirl's "Crossfire"
But while we’re all dreaming of what Spice Girl or X-Men our new best friend would be most like, little siblings make it quite clear that they have plans of their own. Plans that certainly conflict with who we think they should be. It’s something all of us figure out the hard way. Let’s take a look at a few of the sibling lessons Kara learned—and that we were reminded of—in last night’s Supergirl. But seriously, Kara: Don’t. Sure, it’s cute to try to guide your little brother into a sense of style, but more often than not you just end up dressing him as a gender swapped version of yourself, and that can become a little unsettling. 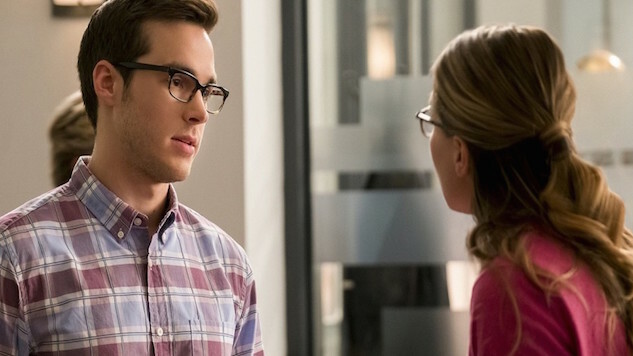 In Mon-El’s case the result is a nerdier, less fashion-aware version of Barry Allen, which means either it’s time for a crossover episode or the CW wardrobe department is getting their skinny brunette males mixed up again. They’re not going to listen anyway. Just keep an eye on any friends you choose to introduce them to, because while your relationship with them may be completely platonic, your sibling may feel differently. If an introduction can’t be avoided, then your only real choice is constant vigilance—and, quite frankly, there aren’t enough IPhone video monitoring systems in the world to cover all of the potential make out spots. Don’t even try to break the rules with a sibling in tow. Only one of two things can happen. Either they tattle on you—boo—or they invite themselves along and you have to babysit—also boo. Even gala invites from tentative frenemies adhere to this principle. And remember, if they’re going to the party you’ll definitely need to show up as well. Major kudos for realizing that “Mike” would need a fake ID and a birth certificate, Kara. Still, sometimes handing everything to your new protégé results in a general quality of, well, laziness. Oh, and entitlement! And low-level credit card fraud. The point is, giving someone everything they could possibly need is always a bad idea. By giving everything to a sibling, you’re throwing their autonomy out the window. Which means you’ll have no choice but to push your personality onto your sibling, and they’ll lack the basic capacity to figure things out for themselves. I mean, seriously, Mon-El? You’re from a technologically advanced planet, but answering a phone doesn’t ring a bell? That honestly should’ve been in the lesson plan for How to Blend in with Earthlings 101. You know, like an older sibling or… ahhhh, I see what happened there. The end of this sibling cycle couldn’t find any closure without the amazing advice of Saint Alex of Danvers. “What works for you might not work for him,” spoken like an older sibling who’s been there, sums up quite a few of last night’s plot lines, but none more succinctly than this. Mon-El is not Kara. I mean, he’s barely even Clark, so what makes Kara think that a job at CatCo, thick-framed glasses, and dubious introductions to Luthors would be Mike’s style? Nothing, really. Sometimes, when you take in a big stray puppy from outer space, you have to trust he’ll find his own path. Give him advice, point him in a direction, and be prepared for him to ignore all of it. It’s frustrating that younger siblings aren’t perfect the moment they appear. They’re too loud, too confused, and too opinionated in all the wrong ways, but by some magical force your love and affection for them doesn’t wane. Of course, there’s that low level hum of, “I’m always gonna be a little mad at you,” but believe this: No matter how complicated or tough that relationship is, there’s always one tougher or meaner or more frustrating that you could be working on instead. Just ask Lena Luthor. Katherine Siegel is a Chicago-based writer and director, and a regular contributor to Paste. You can find out more by checking out her website or follow her on Twitter.